Sport Ireland are also refusing to rule out a wide-scale, independent audit of the beleaguered football body. FAI Executive-Vice President John Delaney. THE FAI ARE subject to “substantial” engagement with the Office for the Director of Corporate Enforcement (ODCE), Sport Ireland CEO John Treacy will tell an Oireachtas Committee on Sport tomorrow. Mr. Treacy’s opening statement to tomorrow’s Committee meeting has been seen by The42. “Sport Ireland is also very cognisant of the FAI’s engagement with the Office of the Director of Corporate Enforcement on their particular enquiries, which we understand to be substantial”, Mr. Treacy will tell Committee members tomorrow. 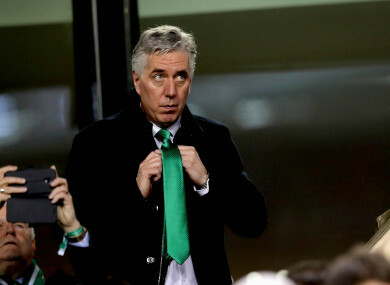 TheJournal reported last week that a second complaint regarding alleged discrepancies in the FAI’s finances has been made to the ODCE, and it is understood that it relates to a matter separate to the €100,000 loan provided to the Association by then-CEO John Delaney in 2017. Elsewhere, Sport Ireland will reserve the right to conduct a full independent audit of the FAI, that will be “as broad and extensive as necessary” to satisfy Sport Ireland that the FAI are compliant with the terms of grant funding, and that their financial controls, management and general governance are of a sufficient standard to restore funding. The sanctioning of that audit depends on Sport Ireland’s satisfaction with the outcomes of the ongoing Mazars and Grant Thornton reviews of the FAI. The FAI have agreed that Sport Ireland will be sent the outcome of the Grant Thornton report, the full and final Mazars report and the review of the FAI’s governance conducted by Jonathan Hall Associates, which recommended that John Delaney be given a new role as Executive Vice President last month. Sport Ireland will also be consulted by Mazars as part of their review. Mr Treacy will also outline the process for the restoration of funding to the FAI. This will include an audit of the FAI’s governance and financial control, and the establishment of a liaison process with the FAI to monitor its implementation of the audit recommendations. This liaison process will be overseen by Sport Ireland’s Audit & Risk Committee, which will meet on 18 April to discuss their specific requirements of the FAI, and the process will be reviewed by the Committee in May. Elsewhere, Sport Ireland are acting swiftly in response to last night’s FAI statement saying that the Association intend to compose a new governance review committee. Sport Ireland expect that committee to hold a majority of external people, and they have been consulted on the appointment of an external member to serve as the Committee’s Chair. Sport Ireland have identified a candidate and hope to agree to their appointment in a meeting with the FAI later today. Mr Treacy will also tell Committee members he is “very disappointed” by the FAI’s decision to decline engagement with many important questions at Wednesday’s meeting with the Oireachtas Committee. Email “FAI subject to 'substantial' enquiries from Office for Director of Corporate Enforcement ”. Feedback on “FAI subject to 'substantial' enquiries from Office for Director of Corporate Enforcement ”.